RAM is the part of computer hardware, which is often the cause of many system problems. 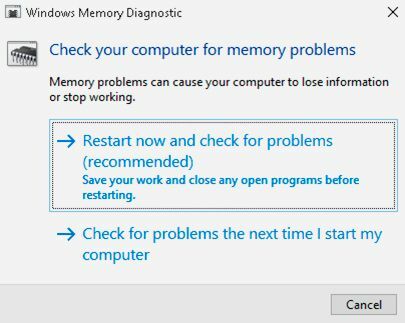 If your computer frequently hangs, blue screen of death (BSOD) appears, often reboots during RAM intensive use (in games, 3D applications, video and graphics editors) – perhaps this is due to internal error in RAM. There are many different utilities for the memory diagnosis, however, typically in the right moment they are not at hand. 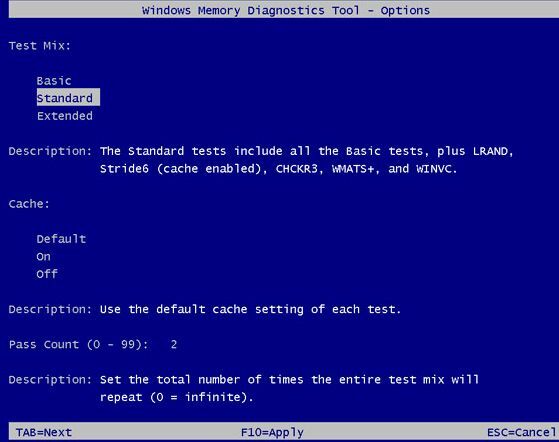 Especially for such cases, Windows has a built-in utility to perform RAM check – Windows Memory Diagnostics tool (mdsched.exe) which appeared in Vista version. 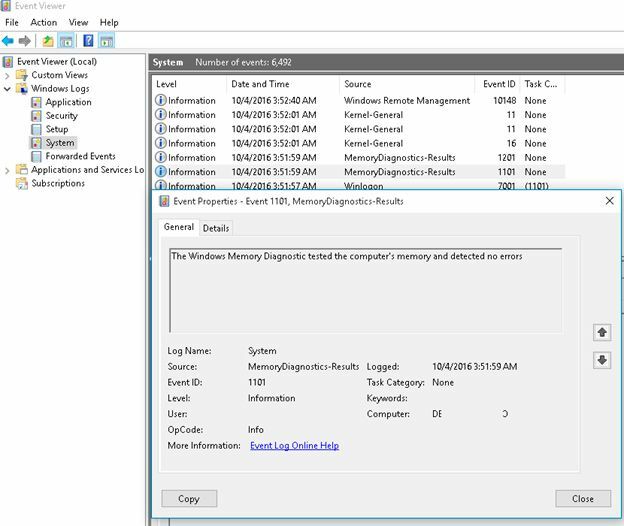 To run Windows Memory Diagnostics tool, just press the key combination Win+R and run mdsched. 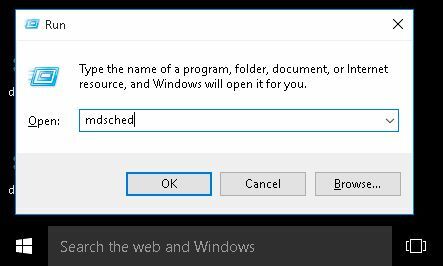 You can select an immediate reboot and run the memory test, or a test can be postponed until the next computer start. The scan starts immediately after your computer restarts. You can leave the default settings, you can press F1 and change them. Tip. Did you know that you can use USB flash drive as an additional RAM source? Check article on that here. 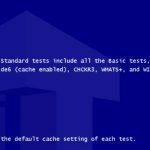 Additionally, you can enable or disable the use of cache and select the pass count of the test (0 to 15). By default, the test run in two passes, if you specify 0, then the test will run until its manual stop. Switching between the settings is performed by using the TAB key and the F10 key runs the tests with selected settings. Depending on the selected test, check can take from a few minutes to several hours. If during the scanning process error appears, the notification will be displayed during the testing process. If there is no error, then after the end of the test the computer restart automatically. After restarting, a notification will appear in the Windows taskbar, which will indicate whether RAM errors have been discovered or not. No memory errors were detected. You can see the scan results in the system events. To open the Events Viewer press Win + R and run eventvwr.msc command, and then go to the section Event Viewer (Local) -> Windows Logs -> System. Find and open events from the source MemoryDiagnostics-Results. 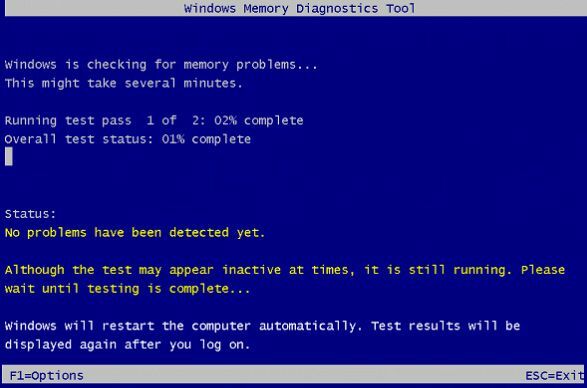 Windows Memory Diagnostic is very convenient to use, since it is always at hand and does not require downloading additional software. The utility is present in all modern operating systems since Windows Vista and to Windows 10. Thanks, Arkitech! Already corrected it. I know you know better. Just giving ya a hard time man :).